The best workouts are both fun and effective. As a child, jumping rope was fun. I wasn't trying to workout or get fit, it was merely something to do in between climbing trees, playing hide-and-go-seek, riding my bike and running from my mom so I wouldn't have to clean my room. I remember I could go forever and still have time for an impromptu challenge of a hundred meter race --- and I wouldn't even break a sweat! Fast forward twenty something years and jumping rope is still a lot fun only now I do it for one purpose --fitness. Though I classify jump rope as cardio it tones and defines my shoulders, upper back, calves, and even my abs and obliques. According to The Jump Rope Institute (yeah, this is a real thing,) the benefits of jump rope, "ranks as an ideal brain exercise, bone builder, and as one of the most efficient ways of improving cardiovascular fitness in as little as ten minutes. [...] In addition, jumping helps to develop the left and right hemispheres of the brain, to further improve spacial awareness and reading skills, and increases memory and mental alertness. Jumping on balls of the feet requires the body and mind to make neural muscular adjustments to imbalances created from continuous jumping. As a result jumping improves dynamic balance and coordination, reflexes, bone density and muscular endurance." Apparently, 10 minutes of consecutive jump rope burns as many calories as 30 minutes of jogging. I hate running, so, this is great news. Bottom line, If you have only ten minutes to workout, reach for that rope. It's fun, effective and your brain and body will thank you! Posted on December 10, 2013 by Christene Carr and tagged Cardio Quick Workout Jump Rope. My favorite part of my workout is always the stretching....maybe I should find a pilates class. 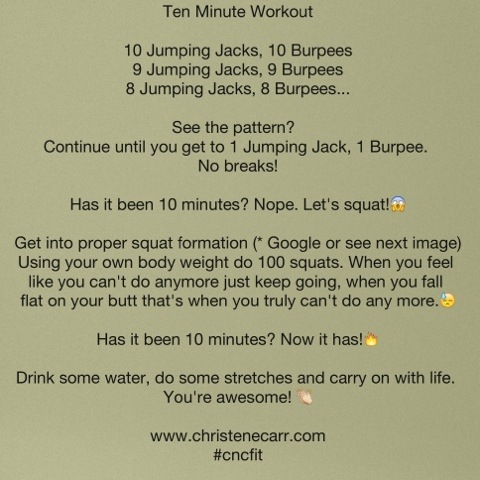 Posted on April 10, 2013 by Christene Carr and tagged Cardio Stairmaster Arm Workout. I never liked running. In fact, it is fair to say I hate running. In my earlier days I was a sprinter where I ran the 100 and 200 meter races. Now, 20 years later, I still don't want to run for more than 45 seconds. So, I figured, why run? Is running a more superior form of cardio? I'm sure it is not, so no more running for me, unless I am being chased. While I'm on my rant about hating running, there are some days when I just can't stand the idea of going to the gym. On those days I move a bit of furniture around and get my sweat going. To all those people who say we all should run a marathon before we die, I simply say, no. Posted on December 9, 2012 by Christene Carr and tagged Running Cardio.